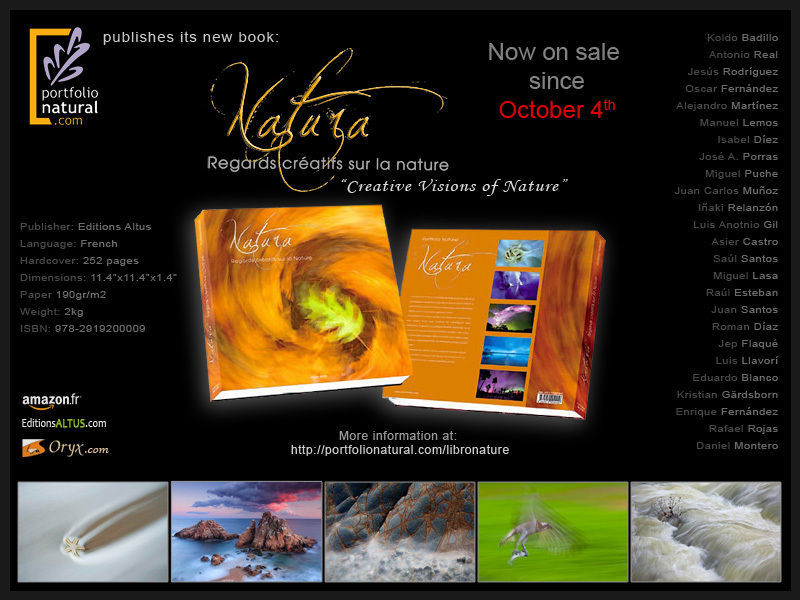 Our new book NATURA has been released. This is the first book of the photography group "Portfolio Natural", to which I proudly belong. NATURA is a massive superior quality coffee table book of 252 pages, full of some of the best photographs of the group Portfolio Natural. Portfolio Natural is a photography group which counts with some of the best award winning nature photographers in Spain, and was created years ago as a way to promote Nature Photography as an art form. This new book shows a compilation of some of the most representative images of the group, covering a wide range of creative approaches and showing images with a style of almost pictorial quality. Abstracts, rocks, water, movement, graphic simplicity, colours, textures, wildlife, landscapes, light, etc. are photographed in surprising and original ways. The book is available only in French and can be ordered directly from the editor Altus Editions or in Amazon. If you will attend the French Nature Photography Festival of Montier-en-Der this year, you will find us there signing the book. Portfolio Natural will also be the "Honoured Foreign Group" invited to the Festival and some of the images shown in the book will be displayed for all to see.